4.Now Right click on layer of the text and click Rasterize Type. 5.Now go to Edit -> Transform -> Perspective and Choose the perspective of the Text. Another easy way in PS is to write your text in black or some other color of your choice. Duplicate that text layer and make your duplicate (the top text layer) text color the same as your background color. When that is done slightly adjust the position of your top text layer, the layer that is the same color as your background to a position that looks good to you. This technique works pretty good when using a thick type font. 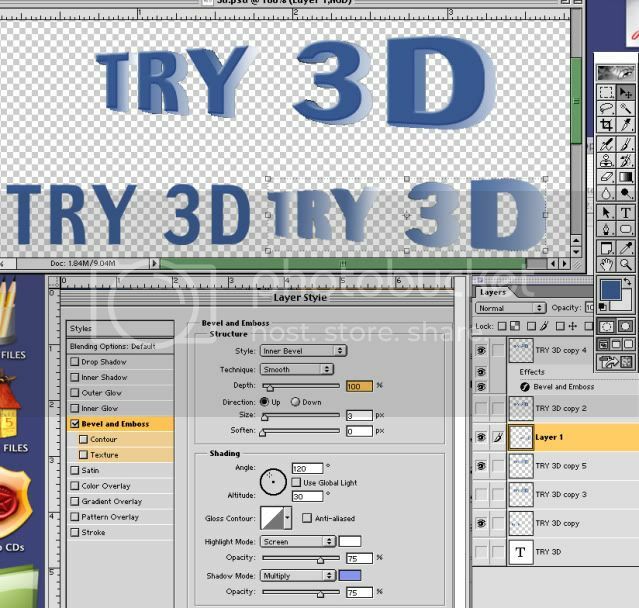 Can get 3D look with only two layers. 5. hide one of these layers and work off the other. move it up 1, over one. Then duplicate the layer. move that up 1, over one, then merge down. 6. duplicate this merged layer and repeat the up 1 over one merge and duplicate until you have the amount of depth you want. 8. selecting each of the letters on the lower layer, use the gradient tool to create the look you want. 9. bevel the top layer just a little bit, changing that dark shadow (usually black) to a color close to your type color. just play around with it. You could also duplicate the gradient depth layer and paste something into it, like brushed steel or ice or whatever and overlay the other gradient. I did this in Photoshop 6. At work I'd make 3D type in Illustrator CS2 which is much better. i just kind of make 2 layers, fill in the holes manually. one of the transforms. a bit of tweaking.. I didnt put much time into this.. just messing about.